When your side entrance is as welcoming as the front! Who says you can’t mix hardscape materials? Brick steps, with a full-range bluestone walkway….. meets “cobble-style” pavers in the driveway. The mix of classic hardscape materials, when used correctly, feels timeless with a traditional fence & gate. Whatever you home’s style, the design expertise of a landscape architect can make it standout. It’s your home, don’t settle for just the ordinary! Autumn is the season of the harvest, when we reap what we planted in the spring. Harvest celebrations give thanks with prayers for future abundance, and continued successful crops. In the United States this, of course, is our Thanksgiving. We hope you had the opportunity to gather around the table with family & friends this harvest season. All of us at Environmental Design Assoc, Inc. are thankful for a successful 2016 season and especially for you, our most valued customers, clients & fellow business associates! Best wishes for a happy, healthy holiday season! The kids are back at school and the last day of summer is here. Hope you all enjoyed the hot & sunny summer of 2016! If you’re thinking about adding a pool, fall and winter is the perfect time to design your project. The off-season’s slower pace allows time to explore design options and create a budget for your backyard oasis. This smaller space created some design challenges. While staying within the township requirements & property setbacks, we were able to delivery all the amenities our client requested, and in style! 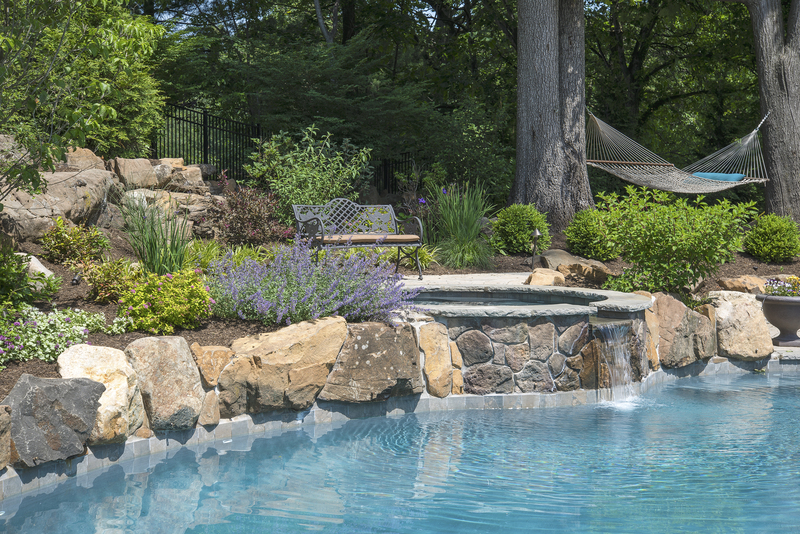 Pool, spa, outdoor kitchen & fire-pit seating spaces flow together beautifully, accented with privacy plantings & colorful perennials. Check our portfolio page to see additional photos of this beautiful project! Forget the barbecue – we want Pizza! Why not change up your backyard barbeque to a Pizza Party! It’s easy when a wood burning pizza oven is included in your outdoor kitchen. 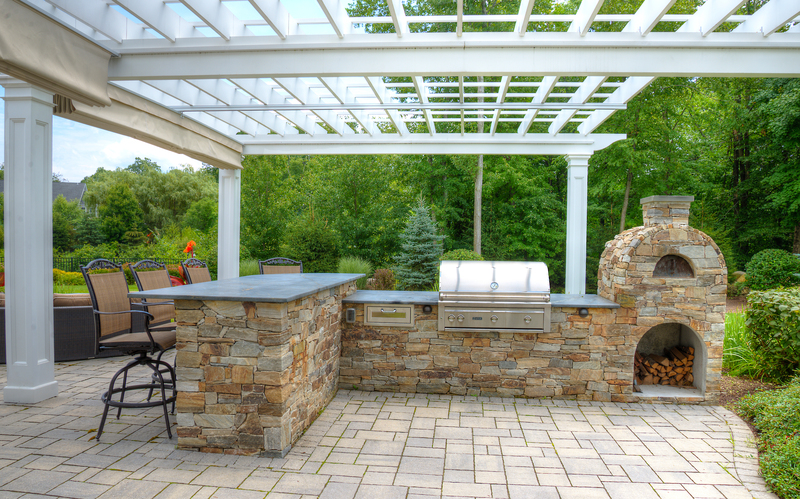 This outdoor bar, grill & pizza oven is finished in quartz veneer stone for a classic natural look. It sits on a Techo-bloc patio, shaded by our custom-designed arbor with canvas shading system to protect from the harsh summer sun. The layout makes your entertaining super comfortable and fun for friends & family. Designing & building unique outdoor spaces is our specialty! A design consultation at your home is always free. We would be happy to meet with you! Your design project can come to life! 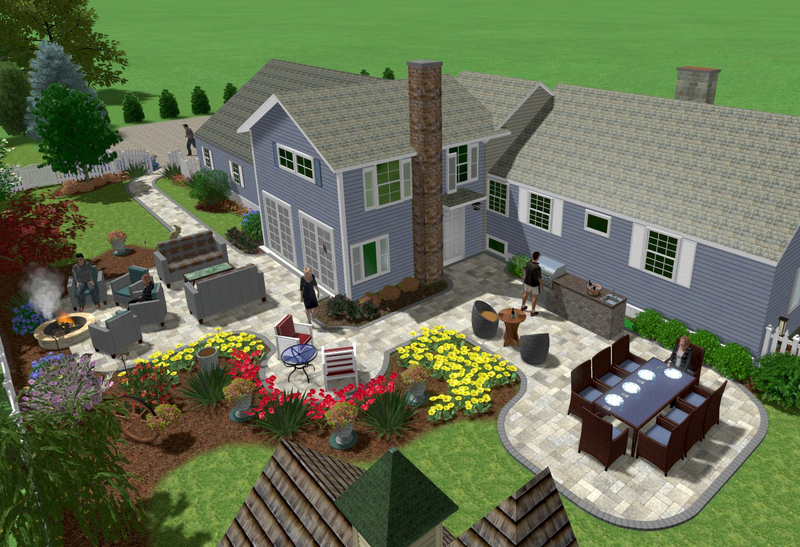 Our Landscape Design plans are created using many pieces of information. After meeting on site with the client to discuss their ideas & style, we start by looking at your property survey. Next, we conduct a field survey to locate all existing trees, walls, boulders, and any other physical features not found on the property survey. The property is photographed to use as a design aid. We import all survey information into the computer to create an accurate basemap, and then the design process begins. A 2-D plan is created, but a 3-D rendering of your home & property with our landscape design shown in full color is available. It’s a great design tool we use to provide our clients a more visual understanding of their project installed. We are currently working on updating our website.